The New York chapter of PR Society of America and New York University PRSSA chapter have at last revealed the agenda for the "New York PR Career Forum" April 2 at the Kimmel Center. 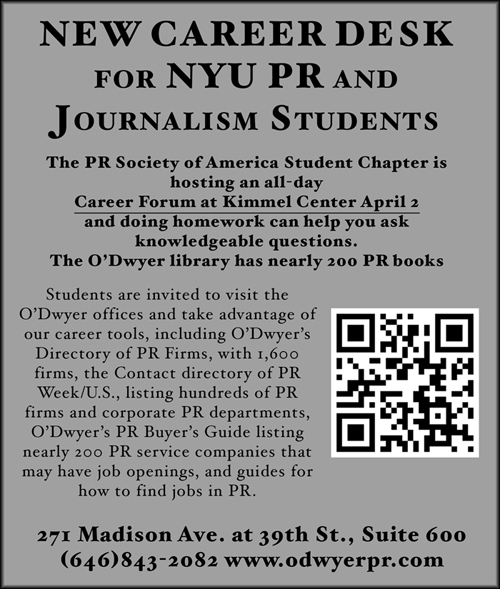 Oddly, it says students will have a chance to learn about such PR specialties as "sports, entertainment and travel" although the two PRSA chapters have blocked display of O’Dwyer magazines that cover those topics in detail and list dozens of PR firms specializing in those practices. 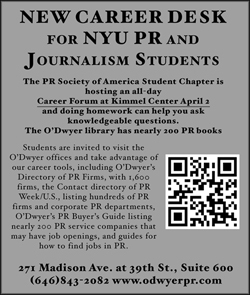 Since there is no literature table at all, the O'Dwyer Co. has set up one in its offices and has advertised that in today’s online and printed NYU newspaper, Washington Square News. The career center desk at O’Dwyer’s not only has our PR and service firm directories but the Contact directory of PR Week/U.S., the members’ directory of PRSA that it stopped publishing in 2005, lists of members of (PR) Seminar and other groups, and numerous books and articles on PR such as Deadly Spin by Wendell Potter that give no-holds-barred descriptions of what actually goes on in PR. Articles on how to look for PR jobs and how to be a freelancer are also included. The career desk is open to both college and high school students in the New York area. The PRSA program lists speeches by New York chapter president Lea-Ann Germinder; Lou Capozzi, chair of the Society’s Foundation, and Kathy Cripps, president of the Council of PR Firms. Not speaking is Shira Palka, president of the Student chapter although she should be on the program. What the program lacks is something for which there is a crying need—how to be in business for yourself, the likely future of many of the students who will be present April 2. A major feature on freelancers was in the March 24 New York Times, describing the 200,000-strong Freelancers Union. The Union answers a major need of freelancers -- health insurance. Premiums range from $225 to $603 a month, which is far lower than the $8,000 to $25,000 yearly similar plans cost via regular carriers such as Oxford. Grads who live at home can remain on their parent’s plan until the age of 26, which is helpful to jobseekers. PR students should explore joining this group and forming their own union of PR freelancers to win better contracts with employers. A major accomplishment of the Freelancers Union was getting New York City to drop the unincorporated business tax for independent workers who make less than $100,000 a year. This saves them $3,400 annually. NYU PR and J students should consider attending the annual writers’ conference of the American Society of Journalists and Authors April 25-27 in the Roosevelt Hotel. They would pick up a lot of lore about being a freelancer from both top and beginning writers. These are no doubt difficult times for writers, as noted by columnist Thomas Frank in the December 2010 Harper’s. He described the “content mills” being run by Demand Media and others that pay writers about $15 for every 300-word item or $2.50 for each piece they proof. The mills are like a temp agency for writers, a “literary maquiladora,” says Frank. The New York Financial Writers Assn., where 90 of its 270 members are freelance, is hosting a job panel April 16 at the Playwright’s Celtic Pub, 732 Eighth ave. (45-46 sts.). Topic is “How to Compete in a Tight Journalism Job Market.” Speakers are Kevin Shinkle, deputy business editor, Associated Press, and Michelle LaRoche, managing editor/real-time desks, Dow Jones. NYU and other PR/J students in New York should consider attending and if there is not enough room, asking for a synopsis of the program. Students who went to a career forum of the Georgia chapter of the Society were told that PR is a function that does not make a profit, that pay is often very low, and that students should go into PR for the "love" of it. A logical question is therefore, why not think of another career? An obvious choice is association management. Cripps was paid $320,000 salary in 2011 plus $16,000 in "compensation from related organizations." Matt Shaw, SVP-communications, was paid $148,650. The staff of CPRF is very small. Only one other name is listed on the CPRF website. Bill Murray, president of PRSA, had a package totaling $382,013 in 2011. VP-PR Arthur Yann, receiving a 25% pay hike, had a total package of $186,485. CFO Phil Bonaventura got an 18% raise to $196,829 and a total package of $235,797. VP-corporate development John Robinson had a total package of $192,373. John Bolton, president of the Arthur W. Page Society, is being paid about $200,000 (the 2012 tax form has not yet been filed). Julia Hood, who worked at Page as president from July 2010 to November 2011, about 18 months, received a total of $394,850, including a $50,000 performance bonus after a year’s work, according to the IRS form 990 tax returns of Page. She returned to PR Week/U.S. Thomas Nicholson, predecessor to Hood, was paid $190,729 in 2010. Julie Freeman, who headed the Int’l Assn. 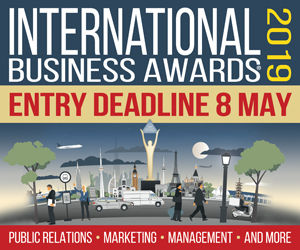 of Business Communicators for ten years until last year, had a package worth $209,005. Her successor, Christopher Sorek, who arrived last summer as executive director and promptly fired 16 of the 32 staffers, refuses to reveal what he is being paid. Meek IABC members accept this situation. The same thing takes place at PRSA where Murray got a new three-year contract in January. Neither he nor the board will say what is in it. NYU PR students definitely ought to explore being an association executive where, if you get in tight enough with the faction controlling the organization, you can get away with practically anything and get well paid for doing it. Once you’re on the same wavelength as the ruling faction, there is no job that is more secure.